During the winter months, Bay View resident Jitka Hanakova works as a business analyst. But from April to October, she takes scuba divers to some of the deepest, least accessible shipwrecks on the Great Lakes. Hanakova started diving in 2000 and quickly fell in love with the sport. She found a good, local charter boat operator in Jerry Guyer and started exploring area shipwrecks. In 2004 she got her captain’s license and worked on Guyer’s boat as a captain. In 2008, she bought her own boat and started her own charter business, Shipwreck Explorers, with Chicago partner Lubo Valuch. Shipwreck Explorers specializes in technical diving-going down deeper and staying down longer than recreational diving. Technical diving involves breathing air mixtures different than the atmosphere, depending on how deep a dive is planned. Trimix includes oxygen, nitrogen, and helium. By reducing the proportions of both nitrogen and oxygen, the helium reduces the risk of nitrogen narcosis and oxygen toxicity. But divers returning from the depths still can’t come up all at once or they risk decompression sickness-the bends. That’s why technical divers return to the surface slowly and in stages. 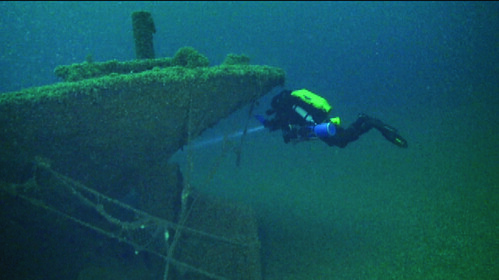 One of the deep Lake Michigan shipwrecks Hanakova has explored, the Tennie and Laura, lies off Port Washington under 310 feet of water and can only be reached on a technical dive.